Joe Palanuk and I drove to Helena on Sunday, September 23rd. It was a good time cruising across Idaho and Montana at 80 mph listening to 60s music on SiriusXM. On Monday, we continued our adventure driving to the fly fishing Mecca – Craig, Montana (halfway between Helena and Great Falls) to fish the world-famous Missouri River below Holter Dam. This 34 mile-long tailwater stretch of the Mo reportedly carries 8,000 trout per mile. 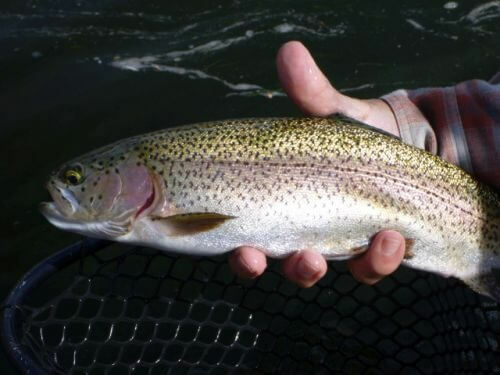 Rainbows and browns are abundant in this section and they average 17 inches in length. It is known for its spring creek-like qualities – big, but slow, meandering with substantial weed beds and crystal clear water. Fall on the Mo offers excellent nymph fishing and, when the water conditions are right, scary good streamer fishing. And, if the weather cooperates, there will be windows of dry fly fishing with baetis, midges, ants and maybe even a few caddis. We spent Monday acquainting ourselves with the river and the various boat launching sites and take out points. In addition, we explored several of the places where walk in wading is allowed. That evening we found a pod of rising trout and spent several hours trying to figure out what they were feeding on. 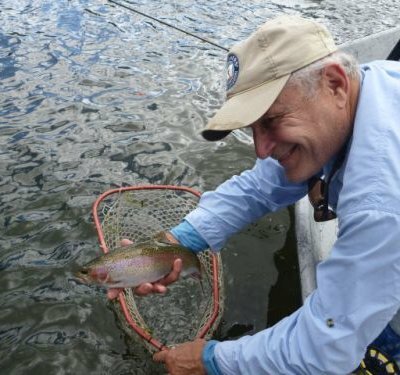 I was able to hook and land a beautiful 20-inch rainbow and missed several other subtle takes. Joe finally had some success hooking numerous big trout on a #18 Serendipity only to have them break the light leader. Tuesday morning we arrived at Headhunters Fly Shop to secure our boat for the day. They delivered the boat at 9 am at the launch site (Stickney Creek) and they promised to shuttle my car to the take out site (Prewett Creek) by 5 pm. This provided us with an 11-mile float between Craig and Hardy and all day to try our best to catch those elusive trout. We used an indicator approach with 2 nymphs attached about 3 feet below a small bobber. Joe managed to land 3 nice fish and I hooked several big trout but was unable to get any of them to the net. The weeds were a real problem and we spent half our time cleaning the vegetation from our outfits. What a pain! Wednesday morning we launched our boat at the Holter Dam Campground ramp planning to float the 7-mile stretch to Craig. Unfortunately, the Headhunters rental boat had a defective rowing seat that required us to call the fly shop and have them replace the boat with another. We lost about 2 hours of fishing time while the transfer was taking place. By the time we were ready to continue our trip, most of the other boats had vacated the area below the dam and we had it pretty much to ourselves. Again, we located a pod of feeding fish and I was able to match the subsurface hatch with a #18 soft hackle to land 4 big rainbows and lose another half dozen hefty trout. Joe did a fantastic job of positioning the boat so as not to disturb the feeding fish. We finished the day rowing through much of the remaining water trying to get to our take out spot by 5 pm. I checked off another of my fly fishing bucket list items (i.e., fishing the big Mo at Craig, Montana). Although it is always challenging trying to figure out how to fish new water without a guide, Joe and I learned a lot about this fishery and we are confident that we can be more successful on future trips to this premier fly fishing location. 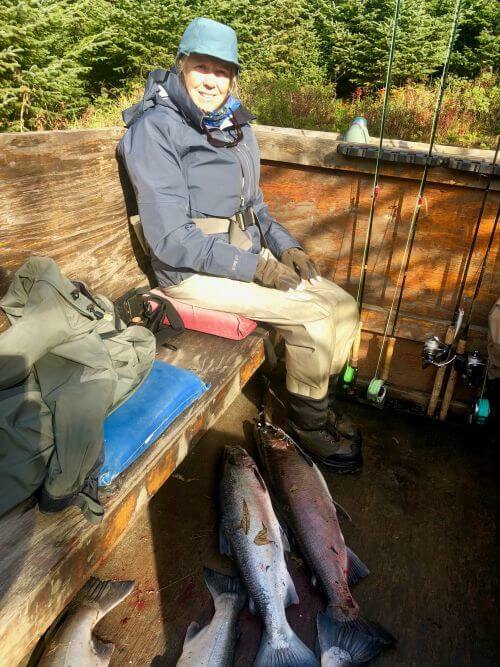 Just a few weeks ago now, in mid-September, my wife Becky, who has been a frequent guest to FCO meetings, and I spent a full week fly fishing at the Kiklukh Lodge on Prince William Sound in SSE Alaska. This was our 4th trip since 2003 with friends for a week fishing for silvers on the Kiklukh River. The Kiklukh has about 6 miles of fishable water that flows from the Bering glacier into the Copper River Delta on the North Gulf Coast. The lodge is about 75 miles ESE of Cordova, Alaska by bush plane, about midway to Yakutat. Becky and I have always gone in mid-September, trying for the best balance of the start of the Alaskan rainy season and the run of some 9,000 silvers often kegged up just off the mouth of the river, without being drowned out by the potentially/often furious Alaskan rainstorms that can bring 6-7” of rain a day and 13 foot tides. Sometimes, as was [partially] the case this year, you find bluebird weather that limits the fishing to pools in the river where the early silvers are holed up – along with the bears. That’s how this year started on our arrival on Sept 21 after our flight from Cordova in a de Havilland ‘Beaver’ was frustratingly delayed several hours due to heavy fog. Upon arrival on the beach ‘landing strip,’ we quickly got our gear and paired up with a guide and another fisher or two and headed out. The water was indeed low and the fishing great but the catching slow. Just off shore, seals and sea lions were ravaging the “would be” spawning salmon. The sea lions tossed up the waiting salmon and literally chomped on their bellies for the eggs. The next morning we went in search of fish by ATV-pulled carts several miles down the beach to the smaller Taiglach River, where we had some success, as well as at a lake impoundment up stream. We caught fish despite an abundance of bears (OK, ‘just’ a sow with a couple of 2-300 pound ‘cubs’) until the first of the Alaskan Gulf Coast rains came blasting in. Fortunately our group for that week totaled only 7 (other times up to 16), so we had the whole length of the river to chase fish. And with the fish no longer kegged up in pools, the bears disbursed as well. The flight out was delayed a day due to the same fog condition that delayed our arrival, but we kept reminding ourselves of the maxim preferring “old” pilots to “bold” pilots. We were glad to be home but are now ready even anxious for next year.